I haven't written about food in quite a while, but I have been on a major salad kick, eating one for dinner almost every night. And when I make a salad it's a serious affair because I really pile on the toppings. My salad is a meal on its own; technically it's a meal that I rarely ever finish. Because I use so many ingredients, I like to cut up my vegetables as soon as I get home from the grocery store. I keep each one in its own container and at dinner I turn the counter into a buffet. So what goes into this ginormous salad? For a drink, I recommend Oberweis Milk. If I eat something for dessert it's been watermelon, watermelon, watermelon. However, if you're up to it and you would like something on the sweet side, try making this Butterscotch Cookie Bar that Kim recommends. How do you make a salad? Do you have an interesting technique or use random ingredients? Please share! It's only a matter of time before I burn myself out on this meal. That looks like a tasty salad! If only taste-a-net was a real thing. I like to mix romaine hearts with spinach and for some reason I like a lot of cucumbers and a lot of tomatoes. 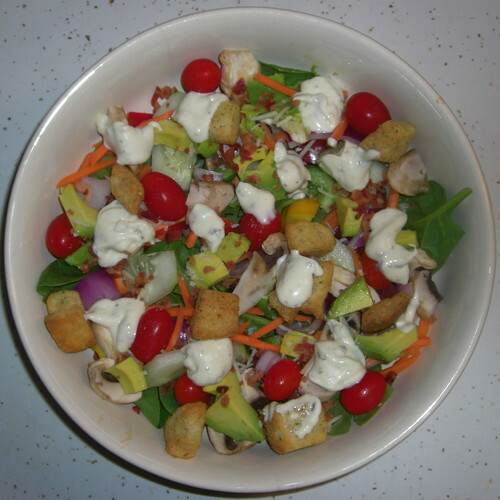 And, if everything isn't chopped up to be the same size, it just isn't as good of a salad to me for some reason. I think it might have something to do with my OCD. I've been eating a salad for lunch every day. I usually use a spring mix or romaine lettuce to start with. For protien, I use either cut up chicken, beans(which also add fiber), or a chopped hard boiled egg. Then for more veggies: cucumber, zucchini, bell pepper of some sort, mushrooms, cherry or grape tomatoes (sometimes even sundried tomatoes chopped up), and olives of some sort. Depending on the dressing, I might add parmesean or feta cheese. And sometimes I use bacon bits and croutons. I've been less than impressed with store bought croutons lately though. So I would rather just toast up some crusty bread, rub raw garlic on it and drizzle with a little olive oil. Voila! My version of salad as a meal. Cauliflower would be a very tasty healthy addition. I'm going to try that. I also have seen this Mexican recipe for pickled onions that is basically: finely slice red onions, add lime juice, a pinch of salt, and let marinate until you're ready to use. I mention this because I like olives or something on my salads as well. I also think prechopping is a fabulous idea. However, I use the prep time to really guage my hunger so I don't overeat. I have an issue with that. Looks yummy - I have been doing chopped chicken & asparagus with some cherry tomatoes and balsalmic dressing. Yum too. Makes my pee stink though. So when did you get to Springfield? You are close - talk Jessica into a girls day and I will come up too. @half-pint: Makes your pee stink. That may be one of the most interesting comments I've ever received. I'm starving and your salad just made me lose my last bit of sanity. I am so hungry now and all I have is a sleeve of poopy generic Ritz crackers and a Lean Cuisine. Blech. As an add on - the other day friends and I (do you know Marji?) were talking sbout that pee stinkin' asparagus thing. There are only about 28% of the ppl in the world who can tell the difference after they eat asparagus. Guess that makes me SPECIAL. That looks yummy but you forgot olives! I was thinking I'd learn from you, instead, ha-ha! Your bowl is really something. It reminds me of a Wendy's all-you-can-eat salad when I was a teen.